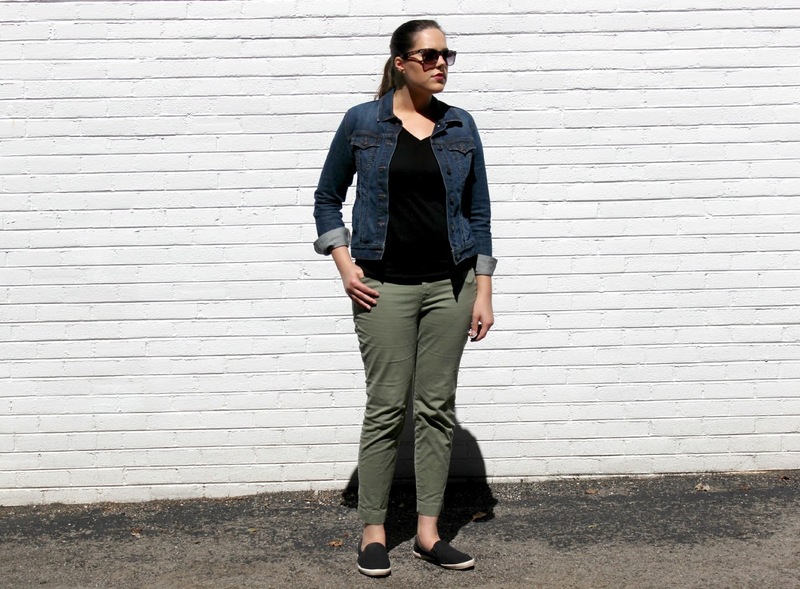 I thought the arrival of fall would be the perfect opportunity to write my first OOTD post on the blog. Since my style and well my body isn’t the kind of thing you lust over on Instagram, I’ve been a bit apprehensive to do these types of posts. However, I’m starting to see more real looking women showing there style and it’s inspired me to do the same. Last week I went out to lunch with the boyfriend and I ended up really liking the outfit I put together. The weather was sunny and 70 degrees. It was a gorgeous day! I decided to bust out my denim jacket and pair it with some pieces I’ve been getting a lot of wear out of this summer. The result was a great transitional outfit that I plan on recreating as the weather cools off. 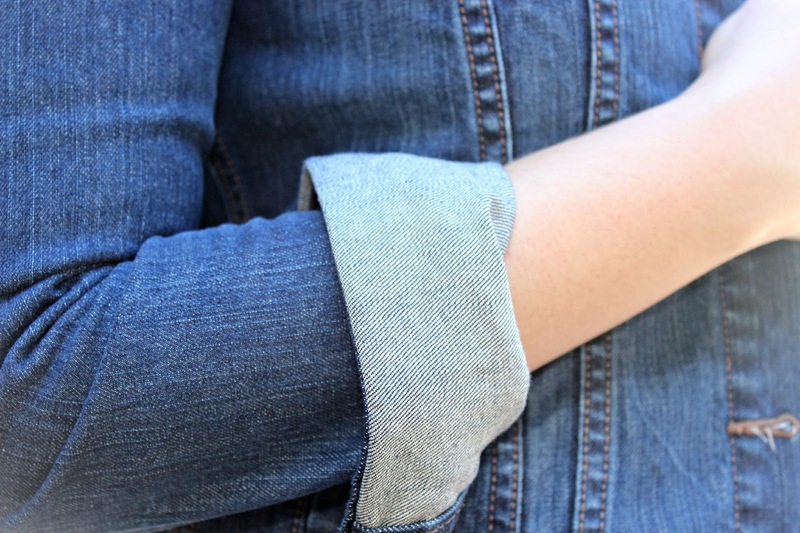 I’m all about cuffing my sleeves at the moment. I normally like to roll up my long sleeve shirts because I find the 3 quarter sleeve look much more comfortable. I decide to do the same with my jacket and I’m loving the look! I found the sunglasses at Target a few weeks ago and I’ve been loving them! They have a RayBan vibe without the hefty price tag. I really enjoyed putting this post together so plan on seeing more fashion/ootd related posts in the future. How do you transition your summer wardrobe into fall? Girl, you are hot! 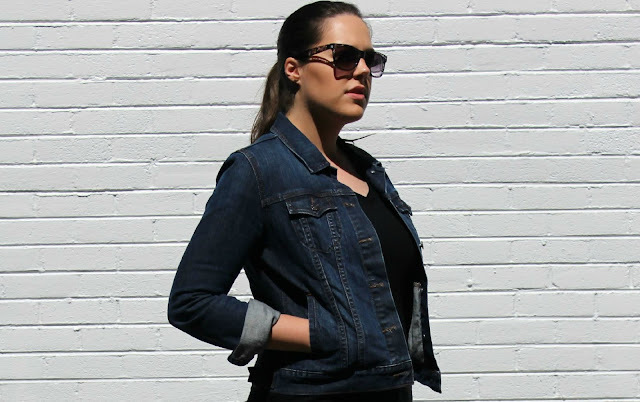 Absolutely love this outfit, it's totally up my alley- I love a good denim jacket with cuffed sleeves. I can't wait for more OOTD posts! The jacket is so pretty! I tend to wear my leather jacket all the time haha. Especially when it's still semi-warm out, yet when it gets later it's too cold to walk around without one! Thanks Naomi! I'm the same way with my jean jacket. As soon as the weather get a bit cooler, I'm attached to it until I need a full on winter coat. lovely outfit! love the jacket! !